Is the Cocker Spaniel Right for You? Cocker Spaniels are known for their joyful and outgoing demeanor. Cocker Spaniel puppies must be introduced to socialization at an early age to avoid any shy tendencies. Originating from the United Kingdom, the American Cocker Spaniel was bred to be a hunting/gun dog that can work in a wide range of conditions. The name “Cocker” comes from the woodcock, which is a bird these dogs were known for flushing out, a task they excel at by being effective retrievers who carry game with a gentle mouth. While they may not be the first, the American Cocker Spaniel is certainly more popular today than their English counterpart. The American Cocker Spaniel is a medium sized, low profile dog. They are, on average, about 15 inches tall as an adult and weigh around 23 pounds. Their most distinguishing feature is their floppy ears, which hang low on the sides of their head. They have a medium length, silky coat that can come in almost any color. 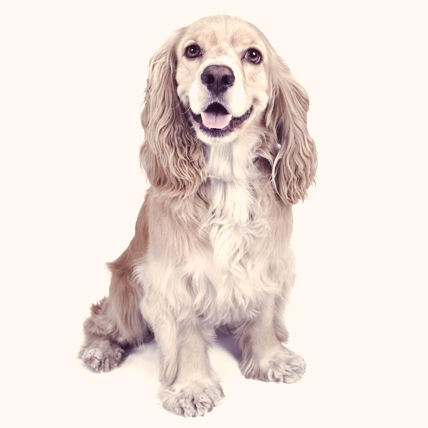 The temperament of the American Cocker Spaniel is basically joyful and outgoing. The breed is friendly with children and other pets. However, socialization at an early age could avoid their tendency for timidity. A loyal dog, this breed is sensitive, cheerful, easily trained, and adaptable. The American Cocker Spaniel can be black and tan, black, any solid color other than black (ASCOB), parti-colored (white and any other solid color), or tan points with the tan less than 10% of the total body.